As one of the most delectable among the Bengali curries, Daab Chingri or prawns cooked in a cocoanut shell, is considered unique. Though there are variations of this dish, our recipe will use the following ingredients:. The tender coconut will be cut to remove the soft meat and the water. A paste is made with coconut meat, mustard seed, poppy seed, green chili and salt. The prawns are lightly fried. The paste is mixed with the prawns and cooked inside the coconut shell in the microwave. Cut the cocoanut to remove the top part of the cocoanut and save the top to be used for covering the cocoanut shell during cooking. Make a hole at the top. Make 2 inch wide opening around the hole. Carefully scrape the soft kernel with a spoon and save it. Soak the poppy seed and mustard seed in warm water for ca. 20 minutes. Overnight soaking would be better. Strain the water before putting into a grinder. Use cocoanut water to wash the seeds. Grind the mixture to a consistent paste. Marinate the prawns with some salt and the salt. Leave aside for 5-10 minutes. Turn on a stove and heat a pan to moderate heat. When the oil gets hot, add the prawns. Turn over the prawns in about a minute when they start becoming translucent. Fry the other side for another minute or so. Add the mustard and poppy-seed paste onto the fried prawns. Spoon in the mixture inside the cocoanut shell. Add a tbsp. 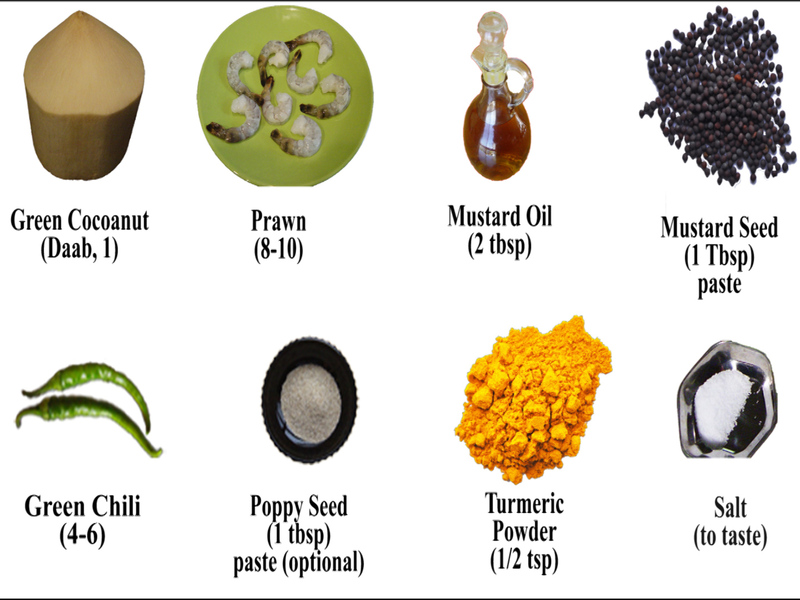 of mustard oil. Add 2 whole green chilies. Cover the opening with the shell top. Put it inside a microwave oven. Microwave it for about 10-15 minutes. You may want to check the curry after about 10 minutes or so to see if the cooking is done. Depending on the power set-up of the microwave oven, cooking time may vary. This completes the daab chingri. It takes about 30 minutes to cook and serve 2 people. Serve it with plain steamed rice.